Roomy flower beds provide a riot of color and interest, but sometimes you just do not have enough room to enjoy everything that a full size garden can give you. This is understandable, and this is one reason many people choose to use container gardening instead. You’re still able to get the benefits of a real garden, but containers can be more versatile if you have a small space to work with. Choosing the right plants is a priority, since you want to ensure that they are going to thrive inside a container and not die down. You also want to choose plants that fit your lifestyle and the climate that you live in since you want to know that they are not going to suffer if you’re on a business trip for four days. Use containers that have drainage in the bottom of them so the roots of the plants do not rot. You might have thought adding gravel or rocks in the bottom was enough, but it is not. Rather than soil, use potting mix such as you’d use for house plants. This growing medium drains more easily than soil and can nourish them and keep them healthy, which is especially helpful if you’re not much of a gardener yourself. You also want to know how many plants is enough per container. You shouldn’t pack them together in a container and then call it done, since plants need room to grow and flourish. You also want to make sure that you do what you can to provide what your container plants need. If you see them withering away, the first step is to try to revive them. However, you can replace them if they become too far gone. If the plant is not doing well because of disease, remove it from other nearby containers until it recovers. There are a number of resources for successful container gardening. The Old Farmer’s Almanac has some tips as well as suggestions for plants which do well in containers – click here. When adding new plants, you’ll need to acclimate them to the conditions of your yard; this is especially important if you get them from a greenhouse. Plants become used to certain conditions, and getting them used to new situations should be done gradually For instance, if the plants had been grown indoors, don’t leave them outside overnight for the first few days, and keep them out of direct sunlight and wind until they’ve gotten accustomed to your yard’s environment. If you have a small space, but not enough time or even knowledge on plants to choose what is needed when let Architectural Landscape Designers do the job for you. 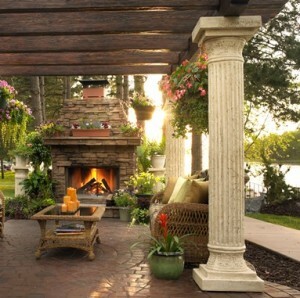 They are able to put together a spot that you will love to spend time in using the container plantings. They can also incorporate them in larger gardens if wanted. They have a green thumb to throw everything together for you, give them a call today to find out more.